Members of Italy's Jewish community have been protesting outside a lawyer's office in Rome where a former Nazi officer has begun work. Shouts of "Murderer!" greeted Erich Priebke, 93, as he arrived for his first day on the back of a scooter. A court ruled last week that Priebke, who is serving a sentence for multiple murders, could work on day release. 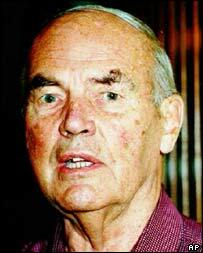 Priebke was jailed for life in 1998 for his role in the massacre of 335 Italians in 1944. He had been discovered working as a schoolteacher in Argentina, and was extradited to stand trial. In 1999, he was given leave to serve the remainder of his sentence under house arrest in his lawyer's home, on the grounds of his ill health. But a military court ruled last week that he could go to work at his lawyer's office "every day, freely" and also to "go out to satisfy, at nearby places and for the time strictly necessary, the indispensable necessities of life" - interpreted as going out for lunch. He will work as a translator, and will also spend time on his biography, which he began during his brief spell in jail. The president of the Jewish community in Rome, Leone Passerman, questioned how it was possible that a Nazi war criminal, allowed to complete a sentence at home on health grounds, was suddenly fit enough to go back to work. "The first thought that I had was of the magistrate that made the provision, perhaps had remembered the lesson that was on the gate at Auschwitz - 'Arbeit macht frei', 'work will set you free' - and perhaps he thought it was right to free Mr Priebke to allow him to work," he said. One Jewish protester, 80-year-old Leone Sonnino, said: "It's an absolute disgrace, people forget. "People say 'It's enough now.' Enough for what? Nothing should be enough, there can never be enough grief." But Priebke's lawyer, Paolo Giachini, defended the decision. "The law says that after a period in prison, inmates have the right to certain benefits, because detention here in Italy isn't just punitive, it tries to re-educate those who have been condemned," he told Reuters news agency. Priebke is serving a life sentence for the murder of 335 people at the Ardeatine Caves outside Rome. The 1944 massacre was a reprisal ordered by Adolf Hitler after partisans killed a patrol of 33 German soldiers. Priebke was one of several officers present during the killing of the men and boys, 75 of whom were Jewish, at the caves.